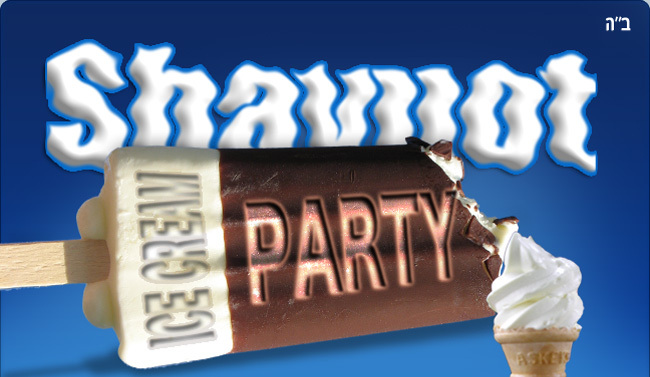 Join us for a reading of the 10 Commandments and a communal ice cream party! A family event - all are welcome! Shavuot, celebrated this year June 3-5, 2014, marks the anniversary of the day when we received the Torah at Mount Sinai. It is the second of the three major festivals (Passover being the first, and Sukkot the third), occurring exactly fifty days after the second day of Passover. The word "Shavuot" means "weeks"; it marks the completion of the seven-week counting period between Passover and Shavuot. During these seven weeks, the Jewish people cleansed themselves of the scars of Egyptian slavery and became a holy nation, ready to enter into an eternal covenant with G‑d with the giving of the Torah.